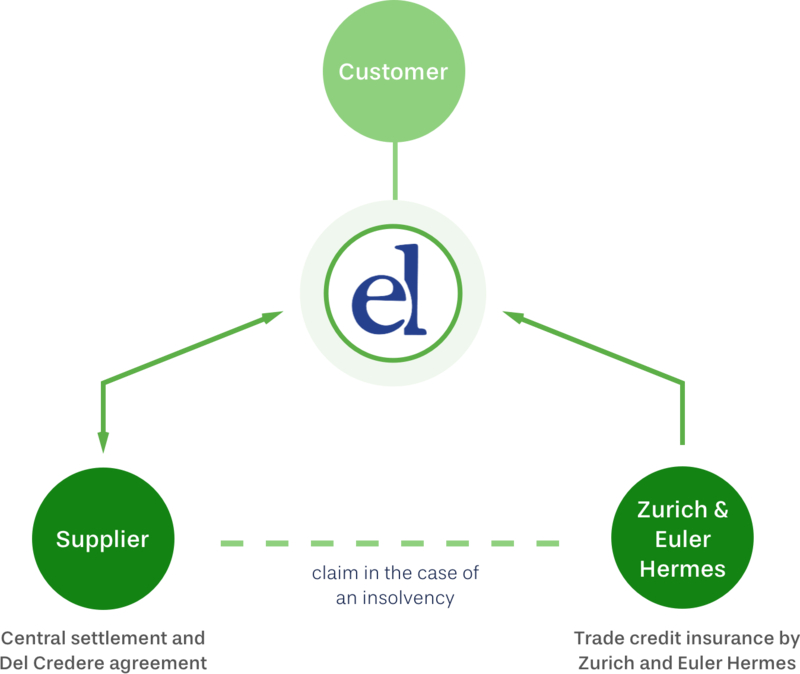 If the coverage is effected via euro delkredere the customer (=buyer of the goods) initiates the insurance. In this case the supplier does not have to provide a self-retention, his receivables are genereally fully covered. Suppliers and euro delkredere become contracting parties for a defined term in the case of central settlement using del credere cover. This provides security and stability in a transparent contractual relationship. By signing the central settlement and del credere contract the supplier acquires full cover of his receivables. The supplier obtains a direct claim for payment against a financially sound credit insurer with „AA-“-rating to the full amount of his receivables. euro delkredere pays the suppliers – other processes are not affected! We ensure a smooth and transparent process and provide the supplier with timely reporting of payments. The terms of payment agreed between the customer and supplier are not changed nor are any other conditions and agreements. euro delkredere does not know the product purchase prices and conditions. The supplier continues to send his invoices to the customer only. The customer releases the payments together with euro delkredere. The suppliers receive a settlement notice from us with all the relevant details for accounting one day before the payment. Accounts receivable management can clear the open items and arrangements can be made for the expected payment. Substantial advantages for our customers and suppliers. The advantages for you are clearly defined! euro delkredere also offers advantage services for our customers that have been proven and tested in practice. We are a team of managing directors which has successfully led international companies during crisis and restructuring in both trade and wholesale as well as in production. We listen and develop customised solutions. In the event of an insolvency all outstanding receivables insured via euro delkredere will be handled in a professional manner. Among other things, this includes asserting the rights with regard to the reservation of title with the insolvency administrator. The defaulted receivables are paid as soon as possible in agreement with the insolvency administrator. As soon as possible we carry out advaned payments. During the entire process, the interests of the suppliers bound to us by contracts, are always given priority. During insolvency proceedings, the insolvency administrator or trustee gains a reliable partner in euro delkredere. In particular, in the event of a debtor-in-possession insolvency („planned insolvency“) safeguarding of the supplies will be the highest priority. euro delkredere has achieved this in several cases. In cases of crisis and extraordinary situations we also ensure stability in the supply chain. We were able to find solutions to cover the suppliers during the preliminary proceedings. euro delkredere is in a position to offer suppliers abroad, who discharge their supply commitment by delivery to a ship owner or forwarder (FOB, FCA etc. ), full insurance cover for the outstanding receivables against the risk of default by the buyer. The advantages of central settlement with respect to risk management and strengthening returns for customers will now also apply to purchasing activities abroad.